Got a Leak? We can help! New Roof Plus has a Haag Certified Roof Inspector to help you figure out that Denver roof leak problem. Roof leaks are nothing to ignore. A small water leak can lead to thousands of dollars in damage with one big storm as we have seen on many Denver roofing repair calls. Call us for a free inspection and repair estimate if you think you might have a roof leak. Roofing leaks can be caused by a number of things. 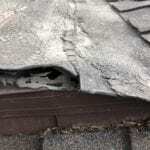 In Denver roofing leaks can be from old age, storm damage, tree damage and more. Hail is the usual cause and can damage shingles, leaving gaps for water. Wind can peel back shingles causing gaps in coverage. Human foot traffic is a very common cause as well. A person can crawl up on your roof to inspect something and step on areas where shingles come together in a valley – the weight of their step can damage the protection. The most common cause for roof leaks are the roof penetration areas – vent pipes, swamp coolers and chimneys for example. These are the areas where flashing material can wear out due to exposure or weather related causes. Some of these roof penetrations have old rubber fittings that worked great for twenty years – but no longer. 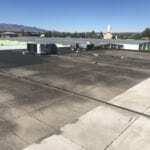 Denver roof repair calls often come to us many months after the problem began. Sometimes a slow leak is hard to notice. The low humidity, high altitude and extreme temperature fluctuations that we enjoy in Colorado can lead to a lot of problems with roofs. This rapid heat expansion and cold contraction effect can cause problems on many different roof systems – including residential and commercial buildings. If you find your roof has a leak, it can often be due to an area that was impacted by this expansion and contraction. Usually roof leaks are sourced to “roof penetrations” from vents, or chimneys or other roof accessories mounted on the roof. Old roof meets new roof. Flat roof repair is tricky. system until it finds a place to enter into your home or building. Here are a few ideas to help you if you want to find a leak on your roof. Check any roof vent or roof pipe protruding from the roof. Often times this penetration may have lost it’s flashing or it’s sealant – like rubberized caulking or other protection. Inspect these types of protrusions carefully for missing parts or sealants. Expand the search area. If there are no suspects in the area, expand your search area. As mentioned earlier, water can seep in 100 feet away and due to the shape of the roof or other reasons, it doesn’t cause a problem until somewhere far away. Check for missing roof tiles or shingles or tears. 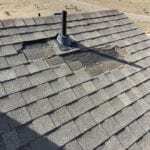 Sometimes wind can blow off a shingle or tile and leave an exposed spot for water to penetrate. This can be especially true if snow or ice has accumulated and the water drips slowly into the decking below. Inspect the roof for any obvious missing shingles. This next issue can be hard for the inexperienced eye to catch. There can be damage to a roof system caused by human traffic on the roof from a previous visit from a roofing person or a gutter person – or some other worker doing something on the roof. The weight of a human stepping in the wrong area on your roof can cause breakage to shingles or flashing, giving water a place to seep in. This could in a roof valley where two angles meet and the roofing material isn’t flush against the decking. The worker put their weight down and “pop” goes the shingle or flashing, causing the tiniest of cracks. Over time, this crack gives way and there’s your problem. These are just a few ideas. Finding a leak is like being a detective. You have to find the evidence and then begin to piece it all together to solve the problem. Let us know how you did and if our suggestions were helpful! Of course, if you would like our professional help we would welcome that as well. All you need to do is call us or fill out our website form and we will be in touch with you.